My name is Patrick O’Connor. I’m a retired academic dean, living in Chicago and a long-time reader of LUANN. After I retired, my daughter and wife encouraged me to join the Chicagoland Costumers’ Guild. Your character, Gunther, especially resonated with me as a guy who has taught himself to use a sewing machine. My fellow-costumer (and President of the International Costumers’ Guild) Phil Gust (your contest winner! ), has encouraged me to write my story, regarding my entry number 272. Since I retired, I’ve done some costume design for masquerades at science-fiction conventions, and even won a few prizes with my entries. At present, I’m vice president of the Chicagoland chapter of the Guild. I’m also their webmaster (www.chicostume.org) as well as printing the International Costumers’ Guild’s newsletter, and having been its editor for several years. Design 272 has its roots in a science-fiction trilogy I self-published on Amazon Kindle Books. When doing the cover design for NaDii, the heroine on the cover of Good Vibrations, Book One of the HaChii Concatenation trilogy, I wanted an ‘off-world’ look for her outfit. 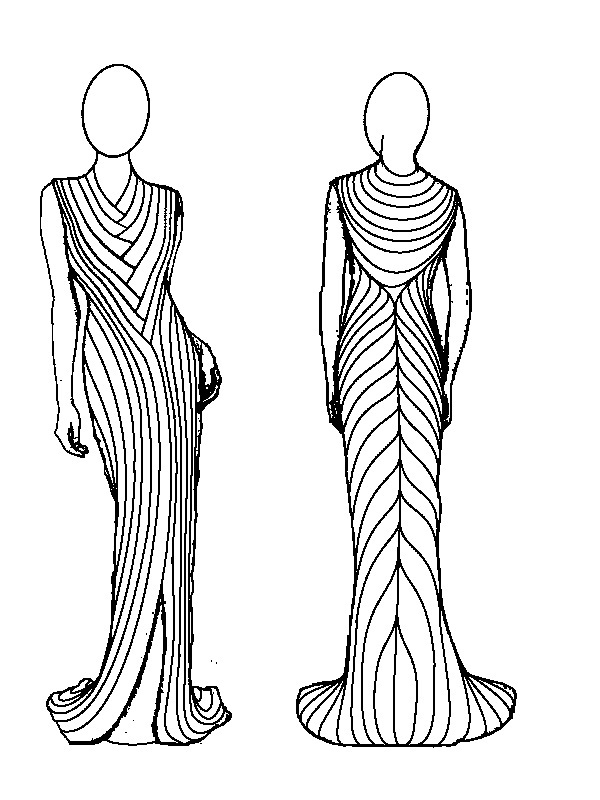 That multi-layered look was what I elaborated into Toni’s wedding dress for my entry. Toni said she wanted a white wedding dress, so I didn’t use the colors NaDii wore in the cover art for my e-Book. I didn’t put Toni’s likeness on the dress design since I was afraid it would be an infringement of copyright, which was forbidden in your guidelines. I did my own artwork for the book cover, though…Take a look on Amazon I DO know how to draw a face…really!